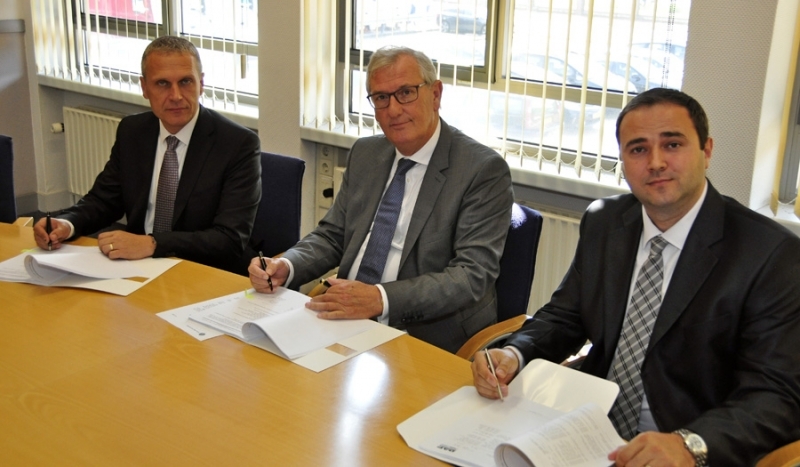 On Thursday, 21 August 2014, representatives of TATRA TRUCKS a.s. and DAF Trucks N.V. signed a renewed agreement for the delivery of engines and cabs for application in TATRA's 4x4, 6x6 and 8x8 vehicles. The agreement also involves delivery of Euro 6 engines to be installed in a new Euro 6 TATRA PHOENIX model that will be introduced in October. The new agreement concerns continued delivery of cabs as well as Euro 3, 4 and 5 engines to TATRA. "For EU markets we are finalizing development of a Euro 6 PHOENIX model", commented Petr Rusek, Chairman of the Board and Business Director of TATRA TRUCKS. "Based on the excellent customer feedback on the DAF supplied Euro 3, 4 and 5 engines, we are happy to be able to apply the latest Euro 6 technology from DAF, which stands out in reliability and efficiency. Next to the 12.9 liter PACCAR MX-13 engine we are also planning introduction of the new 10.8 liter PACCAR MX-11 engine in our popular PHOENIX version." "DAF is proud to continue supply of cabs and engines to TATRA Trucks", said Ron Bonsen. Member of the DAF Board of Management and responsible for Marketing & Sales. "TATRA is a leading manufacturer of all wheel drive vehicles, that perfectly complements DAF's single and double driven range of construction trucks." TATRA PHOENIX vehicles can be serviced by the TATRA dealer network and by the DAF dealer network for the DAF content. A number of DAF dealers is also authorized TATRA dealer. The agreement was signed on TATRA side by Petr Rusek, Chairman of the Board and Business Director of TATRA TRUCKS, and Radek Strouhal, Financial Director and Member of the Board of TATRA TRUCKS. For DAF Ron Bonsen, Board member and Director Marketing & Sales of DAF Trucks, signed the agreement.